Today I ran my first BreakoutEdu game. I’ve been wanting to try it for a while, and I finally got around to researching what the hype is all about. 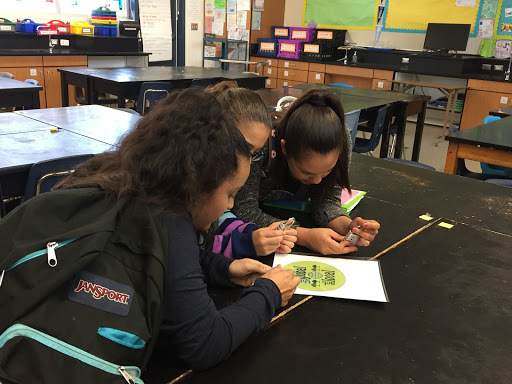 For those of you who don’t know, BreakoutEdu is based on breakout rooms where people are locked inside a room and must use teamwork and critical thinking skills to solve puzzles to break their way out. It’s taking education by storm; but instead of locking our kids in our classrooms, they are locked out of a mysterious box. You can read more about the overall set-up here. I was so nervous to do this! There was so much set-up and so many interdependent parts. I was less concerned about things going wrong with students (mine are very flexible and work with me when I mess something up…which is frequently), and more anxious about forgetting a specific lock or making mistakes with the clues. I’m not good at just taking things I find on the internet and implementing them–they never go as well as I’d like, and I never feel fully engaged. After taking a look at the BreakoutEdu Beta games available on the website, I started working on creating my own game. I designed my puzzles and challenges, then purchased all my locks and tool boxes on Amazon. 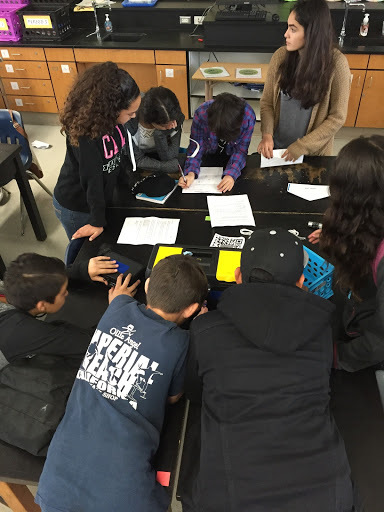 I teach 7th grade science, 30 students per class. As much as I would have loved the simplicity of setting up just one box, I knew it would lead to students sitting off to the side and/or goofing off. I decided to do almost identical 3 boxes with groups of 10. We are studying ecology, so most of the puzzles related to basics of ecology. Origami hearts to solve locked pencil box. Lock & key: Hid a key in an envelope in the supply area. Meant to be easy to build confidence. Directional (speed dial): Picture of a food web with a story below about one of the animals visiting their friends in different locations (ex Sammy goes up to visit his friend Sandy). The directions corresponded to up-down-left-right on the lock. Word lock: Crossword puzzle with 5 letters circled. Unscrambled to form a real word. 3 digit combo: I borrowed the RGB puzzle from Time Warp. 4 digit combo: Bumper sticker that says “Think global, act local.” Count up number of letters in each word to get combo (5636). Hint card: Students also got one hint card in their original materials. Locked pencil box: This was sort of a decoy. 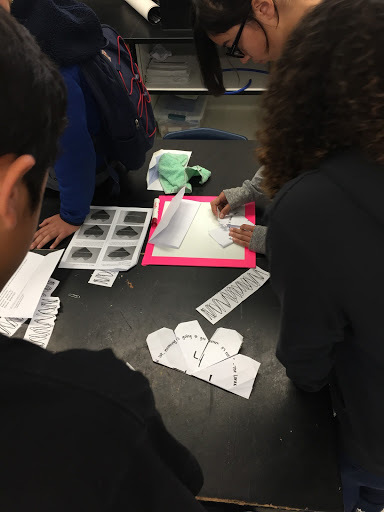 I printed instructions for folding origami hearts, and created flat originals for students to fold and discover a code once they put the papers together. Inside the box was a blacklight flashlight (I had a sign in my room with invisible ink that read “the key is to make a trade with Ms. V” so they could trade in their found keys for an extra hint), a 4-sided puzzle that contained a hint to the location of the key, and an extra hint card. I got to school at 6:30am this morning, school starts at 8:15. I had copies of puzzles to print, and most of the setup to complete. Luckily, I programmed all the locks earlier this week as they arrived from Amazon. I finished my setup at 8:11, just in time to take a few deep breaths before letting the fun begin. My classes quietly line up outside before class, and I usually like them to be inside and working on their warm-up before the bell rings; however, today I kept them outside until the bell. All I told them was “come in, your time starts now, good luck!” and let them figure everything else out for themselves. 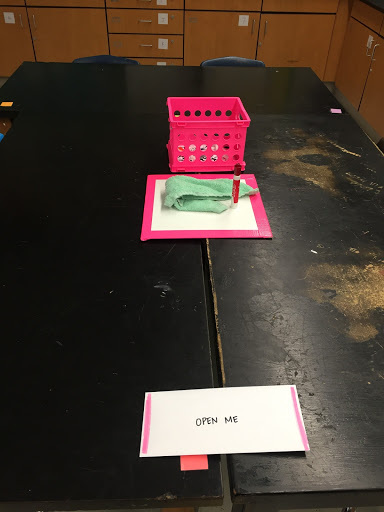 On their desks was an envelope that said “Open Me” which contained their instructions for combining table groups and the general rules and instructions. 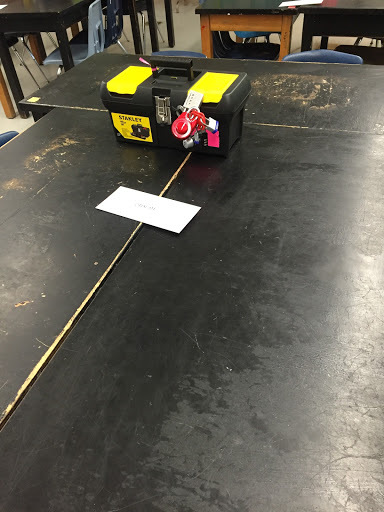 It was fun to listen to students react to the locked boxes on the tables and to get excited about the tasks. Most groups got right to work looking around the room for the hidden clues. Since I had three groups, I created a blue, green, and pink team, and all clues were color coded accordingly. After the timer went off at the end of 45 minutes (also borrowed Time Warp’s online timer with music in the background), we cleaned up and students helped me reset the classroom. We debriefed and discussed what went well, what didn’t go as well, and their favorite and most challenging parts. Since I had 3 classes participating today, we also talked about not spoiling the surprise for later classes. 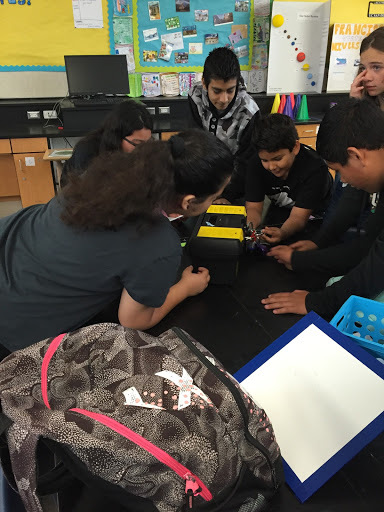 Unfortunately, one of my students overheard a few other students talking about the breakout box, and they already knew at least one of the combos. I told his group they had to show me the solution before I would allow them to unlock those specific locks. Through the course of the day, none of my groups successfully broke into the box. I had 3 groups down to the 3 digit combo lock (RGB puzzle), and one group got really close to solving it. Even though none were successful, all of my students were positive and excited about solving problems. I had 100% engagement for the entire 45 minutes! 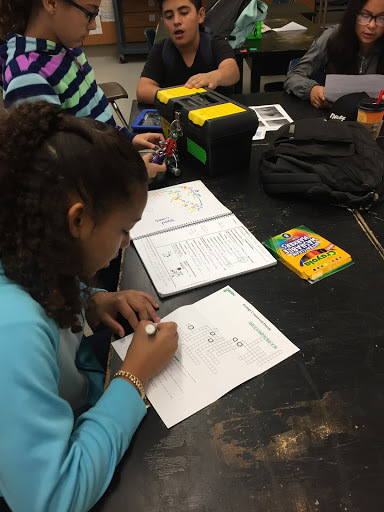 All students were able to find puzzles that suited their strengths, and particular students emerged as leaders within their groups. I heard a lot of amazing discussions on leadership, delegating tasks, problem solving and encouraging each other, and a few references to growth mindset. It was amazing to watch my students problem solve together, and especially fun to not tell them anything! I recorded each Breakout session using Google Hangouts on Air and shared the recordings with our students’ parents. Already, I’ve gotten great feedback from parents! Next time I think I can tackled fitting in new content, rather than just reviewing what we already know. Additionally, set-up wont be nearly as tiring since I’ve done this now. As for students, some of the teams struggled with staying focused on efficiently finishing tasks, not jumping from one puzzle to another, or randomly trying combos. It was so hard for me not to jump in and redirect them! The only time I had to step in was a few instances when students were trying to pry open my boxes. 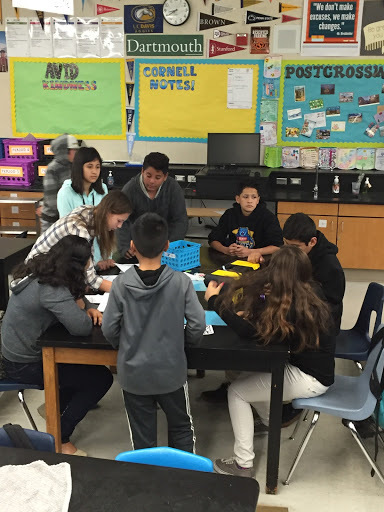 I’m excited to plan another Breakout, next time for my 7th grade AVID students. We were lucky to have our AVID tutors in to observe, and I could see how badly they wanted to jump in and work on the puzzles too. I’d love to do one that includes them. I’ll also plan another Breakout for my 7th grade science later this semester. My kids are already bugging me asking when we can do this again! Success!! Congrats!! I also are new to Breakout & have had a blast creating puzzles. Stumbled on this accidentally. Is there a website or place you went online to learn more about this and how to get started? Any help would be appreciated! Check out http://www.breakoutedu.com or search them on Facebook. Thank you! I'm so excited, and I can't wait to plan my next one! 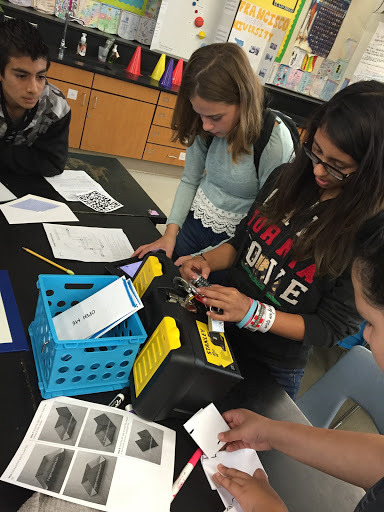 Mari, I just added your BreakOutEDU website as a side quest in my gamified classroom. Thanks for the inspiration! Wow great stuff! We have a mentoring effort going right now and at times take time during the day for these kinds of activities. This will be a great arrow to add to the quiver. Thanks for sharing!